Due to its large Tamil population, the Northern Province is sometimes referred to as Sri Lanka's Tamil country. Northern Province is located in the north of Sri Lanka and is just 22 miles (35 km) from India. It is connected with Indian mainland by mythical Adam's Bridge (also known as Sethu Paalam or Rama's Bridge). It has an area of 8,884 square kilometres (3,430 sq mi). The province is surrounded by the Gulf of Mannar and Palk Bay to the west, Palk Strait to the north west, the Bay of Bengal to the north and east and the Eastern, North Central and North Western provinces to the south. 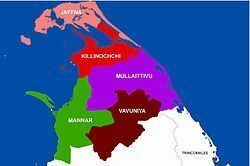 The province is divided into two distinct geographic areas: Jaffna peninsula and the Vanni. Jaffna peninsula is irrigated by underground aquifers fed by wells whereas the Vanni has irrigation tanks fed by perennial rivers. Major rivers include: Akkarayan Aru, Aruvi Aru, Kanakarayan Aru, Kodalikkallu Aru, Mandekal Aru, Nay Aru, Netheli Aru, Pali Aru, Pallavarayankaddu Aru, Parangi Aru, Per Aru, Piramenthal Aru, Theravil Aru. 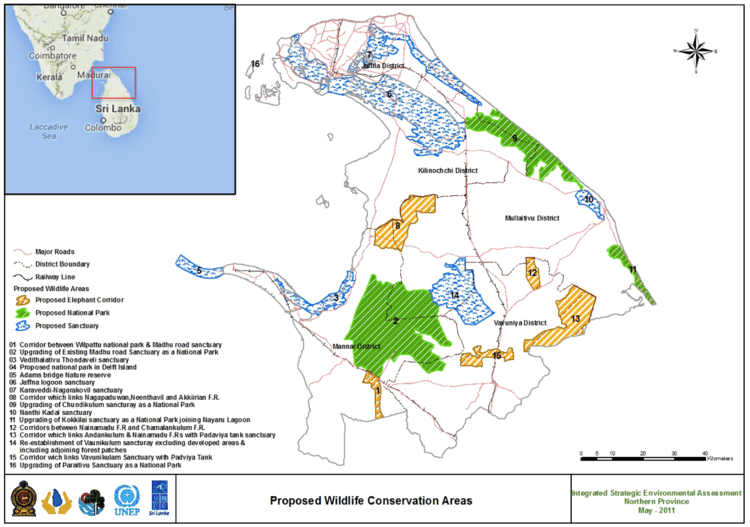 The province has a number of lagoons, the largest being Jaffna Lagoon, Nanthi Kadal, Chundikkulam Lagoon, Vadamarachchi Lagoon, Uppu Aru Lagoon, Kokkilai lagoon, Nai Aru Lagoon and Chalai Lagoon. Most of the islands around Sri Lanka are to be found to the west of the Northern Province. The largest islands are: Velanaitivu (Kayts), Neduntivu (Delft), Karaitivu, Pungudutivu and Mandativu. 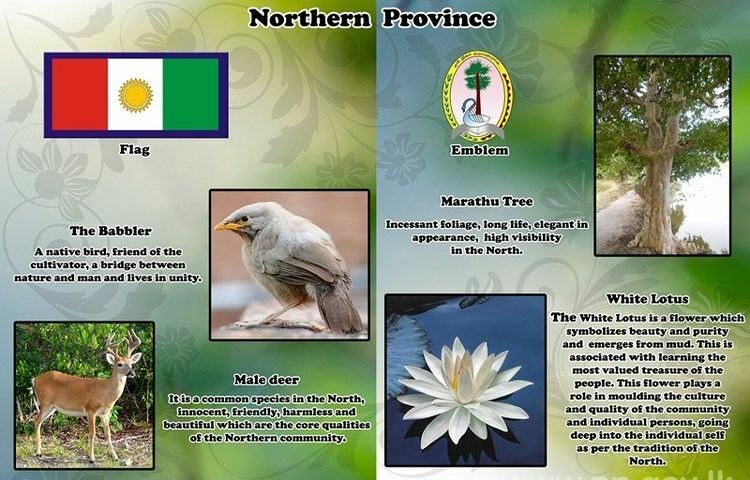 Northern Province is covered in tropical forests, with numerous rivers flowing through them. 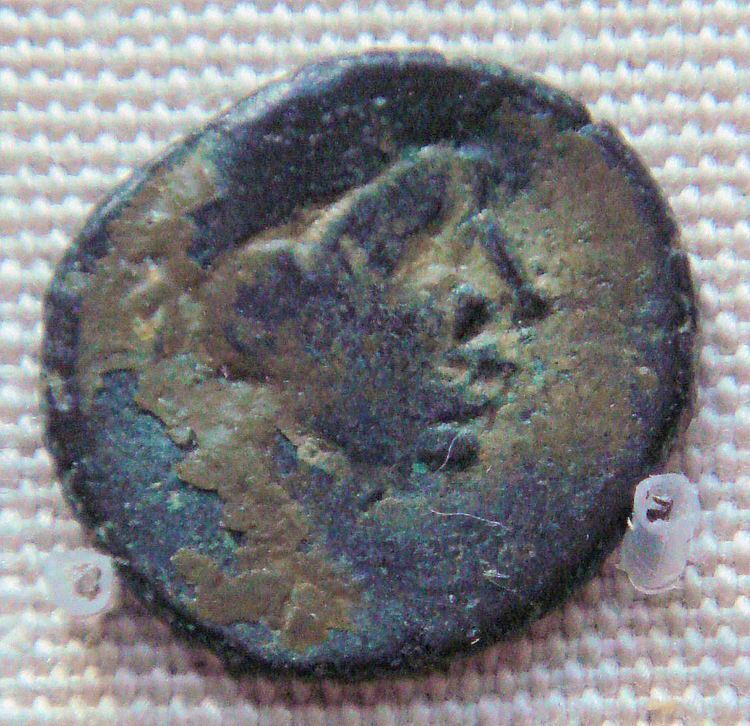 The north-west coast is part of the deep Cauvery (Kaveri) River Basin of south-east India, which has been collecting sediments from the highlands of India and Sri Lanka since the breakup of Gondwanaland. Sri Lanka enjoys a typical tropical monsoonal climate. The Northern Province tends to be hot and dry in the dry season (February to September), and moderately cool and wet in the wet season (October to January). The province's climate is of the tropical kind and therefore during monsoons there is always the chance of a deluge. In the lowlands the climate is typically tropical with the average temperature is around 28° to 30° for the year. However, on the whole, January is the coolest month and May is the hottest month. Relative Humidity varies from 70% during the day to 90% at night. 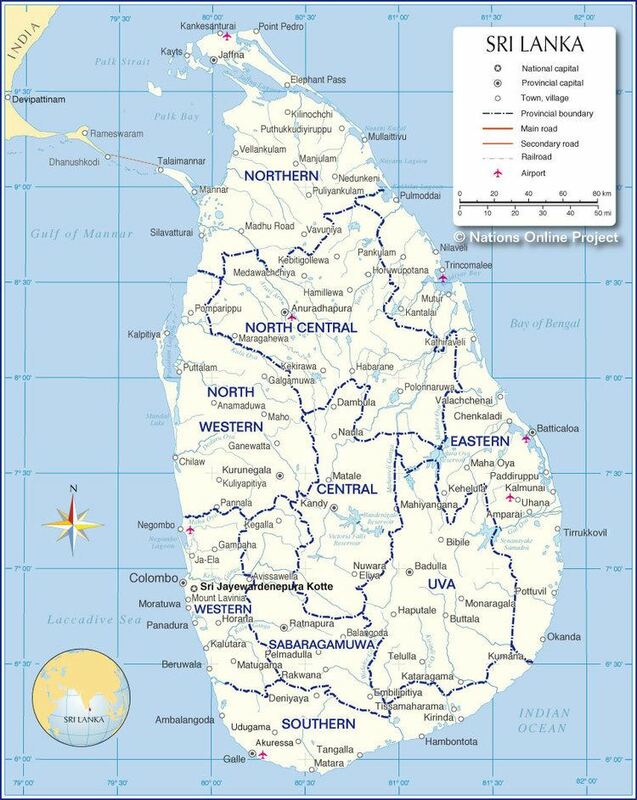 The Dry Zone of the Sri Lanka is the north and east of the island, this region is affected by the north east monsoon(December to March) and southwest monsoon (June to October). It is thought to be dry because most of the rains fall during the north-east monsoon. Annual rainfall is less than 1250 mm in the north west and south east of the Inland. It has two rainy seasons South West Monsoon- May to August, North East Monsoon- November to February. The Northern Province is divided into five administrative districts, 33 Divisional Secretary's Divisions (DS Divisions) and 912 Grama Niladhari Divisions (GN Divisions). The Northern province's population was 1,058,762 in 2012. 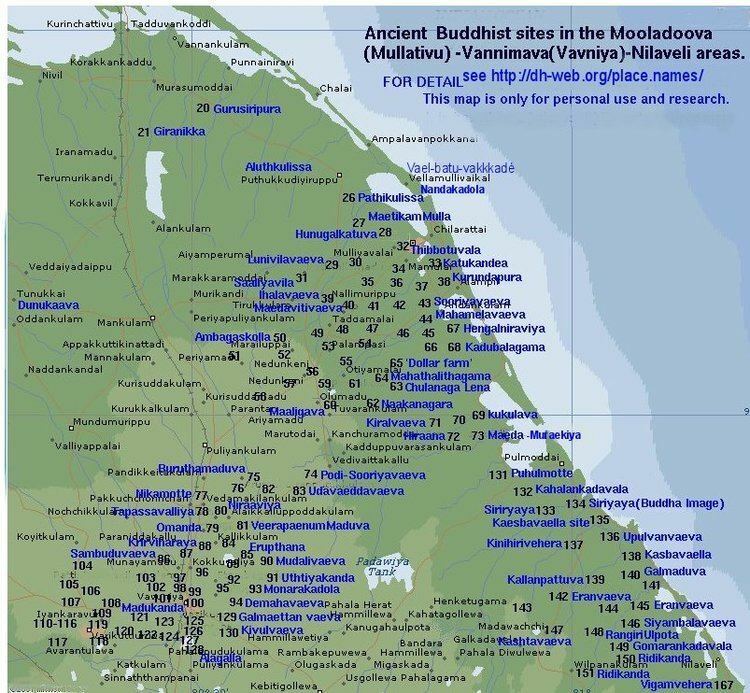 The majority of the population are Sri Lankan Tamil, with a minority Sri Lankan Moor and Sinhalese population. The population of the province, like that of the Eastern Province, was heavily affected by the civil war. The war killed an estimated 100,000 people. Several hundred thousand Sri Lankan Tamils, possibly as much as one million, emigrated to the West during the war. Many Sri Lankan Tamils also moved to the relative safety of the capital Colombo. Most of the Sri Lankan Moors and Sinhalese who lived in the province fled to other parts of Sri Lanka or were forcibly expelled by the rebel Liberation Tigers of Tamil Eelam, though most of them have returned to the province since the end of the civil war. First elected representation at provincial level to a legislative came about after the Second Manning Reforms of the Legislative Council of Ceylon which assigned a seat to the Northern Province. With universal adult suffrage been enabled through the Donoughmore Constitution, representatives from the province were elected to parliament. Currently Two Electoral Districts, namely Jaffna Electoral District and Vanni Electoral District which elects 15 of the 225 members of the Sri Lankan Parliament. Until 1978, the administration of the provinces in Sri Lanka where mainly carried out by the Government Agents of the districts. Through the 13th Amendment to the 1978 Constitution of Sri Lanka and the Provincial Councils Act, No. 42 of 1987, Provincial council were established in the Provinces. On 1 March 1990, just as the IPKF were preparing to withdraw from Sri Lanka, Permual moved a motion in the North-East Provincial Council declaraing an independent Eelam. 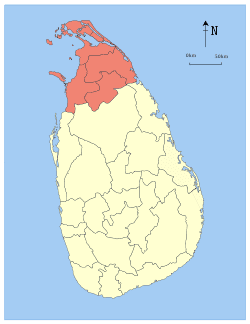 Since the early 1990s parts of the north-east provinces were controlled by the LTTE, which according to the Sri Lankan government owned Sunday Observer newspaper, prevented elections The north-east was governed directly from Colombo until May 2008 when elections were held in the demerged the Eastern Province which was followed by elections in the Northern Province in September 2013. Following the end of the civil war, G.A. Chandrasiri was sworn in as the Governor of Northern Province with effect 12 July 2009 and C. V. Vigneswaran was appointed Chief Minister of the Northern Province following the provincial council elections 2013. Major Political parties in the province are Tamil National Alliance led by Ilankai Tamil Arasu Katchi, DTNA, United National Party, Sri Lanka Freedom Party and EPDP. Majority of the people earn their livelihood as farmers, fishers and professionals in the civil and business sectors. Before the civil war cement and chemical industries along fishing with fishing made a major contribution to the economy. However now they have been abandoned and the factories are rusting. Close to a third of the population is unemployed far more than Sri Lanka and work is mostly informal and thus unstable. The population that managed to flee to foreign nations provide a steady flow of foreign remittances to their relatives in the province. However, with the election victory of President Maithripala Sirisena and the removal of restrictions that prevented foreigners from visiting the north contributed to the sense of economic renewal alongside the development of Kankesanthurai Harbor the Palali Airport. Hospitals and schools as well as a cultural center and vocational training facility being built in Jaffna. Investments have also started to flow into an industries such as the Paranthan Chemical factory. The Northern Province's contribution the Gross Domestic Product is the lowest among the nine provinces representing only 3.5% of the overall GDP in 2015 however the Provincial Gross Domestic Product(PGDP) Nominal Growth Rate was 12.1% in 2015 and is the fastest growing province alongside the North Central Province. Northern Province being an agricultural dominant province, where agricultural sector is 25.9% and trade sector comes next to it is 19.3%. Most of the people engaged in service sector covering 31.2% of the total. Transport infrastructure in the province is poorly developed and limits economic activity. Most people still use bullock carts for transportation. A Class roads or National Highways - Maintained and controlled by Central Government. B Class roads or Provincial Highways - Maintained and controlled by Provincial Government. There are number of underdeveloped C and D Class roads in the province. Sri Lanka Railways operates the country’s railway network, including the Northern Line and the Mannar Line, in the Northern Province. Most of the railways were developed during the British colonial period. The railway lines between Vavuniya, Jaffna, and Kankesanthurai and between Medawachchiya and Talaimannar were destroyed during the civil war. For a time during reconstruction the Northern Line operated south of Pallai, while the Mannar Line operates between Medawachchiya and Madhu Road, but by 2015 it was reconstructed past Jaffna to its terminus at Kankesanthirai. Both lines are under reconstruction to restore the original network and upgrade the operating technology used. Airways and airports are underdeveloped in this province. Palaly Airport is the primary airport in the province, once an international airport that had regular passenger flight service to Colombo and Trichirapalli, India. It is under the control of the Sri Lanka Navy now and is planned to be turned into an International airport again with the help of India. Daily flights between Colombo and Jaffna are available. There are a few small airports and airstrips in Vavuniya and Iranamadu. The Northern Province has one university, the University of Jaffna which became independent in 1979, previously having been a campus of the University of Sri Lanka since 1974. The university has approximately 7,000 students. The province is known for its institutions of education, many of which were established by Christian missionaries. The first newspaper in Jaffna, Uthayatharakai (Morning Star) was published in 1841 by C.W. Thamotharampillai By the 1940s, daily newspapers had already been started Eelakesari and Virakesari in 1930 and Thinakaran in 1932 and journals committed to the growth of modernistic, socially purposive literature Bharati and Marumalarchi in 1946 had also started coming out. Few newspapers are published in the province now in the principal language of Tamil. None in English and Sinhala. Before the Civil war commenced dozens of newspapers and magazines were published. Press freedom is limited and mostly censored by Government and Pro-government paramilitaries. Now most of the Tamil, English, Sinhala magazines come from Colombo and Chennai, India.